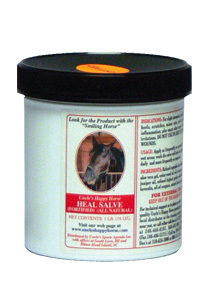 Happy Horse Heal Salve Fortified is the most effective healing salve you can keep in your tack room. It always gives unbelievably great results. Horsemen begin as skeptics and quickly become believers. The same conditions you have treated for two weeks with dips, injections, etc. are gone just from using Heal Salve Fortified for 2 or 3 days. We have horsemen call us and tell us that Heal Salve Fortified is the greatest product they have seen on the market and we believe that to be true. A pound lasts a long time. It is cooling and soothing on the skin, never burns or blisters and the coloring agent is all natural and washes off with mild soap and water. It is an ALL NATURAL product that contains no chemicals. We know that when you use it once, you will make it a product you always use and keep in the barn. Heal Salve Fortified will produce results that most other products cannot. It contains ingredients that have anti-fungal, anti-viral, and antibacterial properties. It is not meant as a cure of any disease and in cases of skin problems, consult your health professional. It applies easily, only the smallest amounts are required. You will depend on it as an essential part of your operation. Apply daily, most preferably by rubbing it into a wet skin surface. First clean the area with a non-irritating soap; then apply Heal Salve Fortified and rub it into the area. Heal Salve Fortified is meant for EXTERNAL USE ONLY. It is safe to use but we advise not getting it in the eyes and keeping it away from children and pets. It is available only in the distinctive jar with the picture of the Smiling Horse on the label. DO NOT use on deep cuts or deep puncture wounds. Ingredients: Refined vegetable oils, sulfanated compound, aloe vera gel, cedar wood oil, oil of rosemary, ravensara oil, juniper oil, refined highest grade collodial silver solution, lavendin, oil or oregano, natural food grade green coloring.